2015-03-15 ~ National Association of Postal Employees, Tirunelveli Division. Subject : Declaration of Assets and Liabilities by public servants under section 44 of the Lokpal and Lokayuktas Act, 2013 – Clarification regarding formats to be used for filing returns under the Act. (b) The Public Servants (Furnishing of Information and Annual Return of Assets and Liabilities and the Limits for Exemption of Assets in Filing Returns) Amendment Rules, 2014, extending the time limit for filing of revised returns (pl see proviso under sub- rule 2 of rule 3 of the principal rules) by all public servants from 31st December 2014 to 30th April, 2015. (iii) The annual return for subsequent years as on 31st March every year should be filed on or before 31 6t July of that year. A. Declaration to be filed with Return of Assets and Liabilities on First Appointment or as on the 31st March, 20…….. (Under Sec 44 of the Lokpal and Lokayuktas Act, 2013.) [Appendix-I of the notification dated 14.07.2014]. (a) FORM No. I – Details of Public Servant, his/ her spouse and dependent children[Appendix-II of the notification dated 14.07.2014]. (b) Modified FORM No. II – Statement of movable property on first appointment or as on the 31st March, 20…[Appendix-II of the notification dated 14.07.2014 as modified vide notification dated 26.12.2014]. (c) FORM NO. III – Statement of immovable property on first appointment or as on the 31st March, 20…. (e.g. Lands, House, Shops, Other Buildings, etc.) [Held by Public Servant, his/her spouse and dependent children] [Appendix-II of the notification dated 14.07.2014]. (d) Modified FORM No. IV – Statement of Debts and Other Liabilities on first appointment or as on 31st March, 20…. [Appendix-II of the notification dated 14.07.2014 as modified vide notification dated 26.12.2014]. 4. It is requested to ensure that all officers and staff in your Ministry/ Department/ organizations file the said declarations/returns within the prescribed time-limits, in the aforementioned forms. As per a news item reported in the Economic Times, DOPT is considering a proposal to bring Helicopter Rides under LTC Scheme applicable to Central Government Employees. It is reported that cost analysis has been called for by DOPT regading Helicopter flights in the Country. As such Central Government Emplyees are allowed travel by various classes by road and Trains depending upon the posts held by them. In addition to Bus and Train Travel under LTC, Central Government Employees who are in receipt of Grade Pay of Rs. 5400 and above are entitled to travel by Air while availing Leave Travel Concession. In respect of certain specified destinations such as North East Regions (NER), Jammu and Kashmir, Andaman and Nicobar, Employees have been allowed to travel by Air from a specified place viz., from Kolkata in the case of LTC to NER. The government is discussing a proposal to allow its employees to claim leave travel concession for domestic helicopter flights, a move seen boosting the helicopter-ferrying business. At present, central government employees can claim leave travel concession (LTC) only for using scheduled commercial airline flights, preferably Air India. According to a civil aviation ministry official, the Department of Personnel and Training (DoPT) had sought a cost analysis of helicopter rides in the country. “We have sent our analysis to the DoPT on the cost of flying in a helicopter. They had asked for it since they plan to bring helicopter rides under the LTC scheme,” the official, who did not wish to be named, told ET. The helicopter industry has welcomed the proposal, which aims to extend the travel concession to some 3 million central government workers. “It creates business for helicopter operators in the country. Currently, helicopter operations are available in areas that have difficult terrain and no other means of connectivity, as helicopter rides are expensive,” said Harsh Vardhan Sharma, treasurer at Business Aircraft Operators’ Association and owner of Himalayan Heli Services Ltd, a helicopter operator. “The rides are expensive because there is less demand. A move like this would increase volumes that will bring down fares in the affordable category.” According to Sharma, helicopter fare for the Katra-Mata Vaishno Devi Shrine ride has come down by half mainly due to volumes. “During peak season, helicopter operators ferry about 1,000 people a day that comes down to about 800 a day during non-peak season between Katra and Mata Vaishno Devi Shrine. This had led to a 50% fall in fares from its high fare days,” Sharma said. 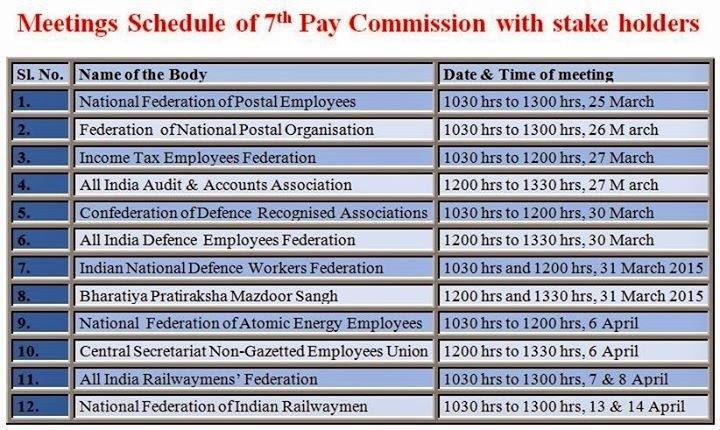 A meeting with the 7th Central Pay Commission has been scheduled for the Federation on 26th March 2015. between 10.30 am and 1 pm in the Conference Room 1 floor B-14/A Chatrapati Shivaji Bhawan, Qutub Institutional Area, New Delhi. The Seventh, Central Pay Commission has, from the time of its constitution, engaged with a variety of stakeholders on the issues which it has been mandated to cover in accordance with its terms of reference. Based on the wide ranging interaction the Commission has had in this period, certain broad issues have emerged before the Commission. The Commission has also been seeking from individual Ministries / Departments their views on the issues posed, in relation to matters that are relevant to the Ministries. The Commission has had the occasion to interact with the Federation in May 2014. A meeting was also held on 25 February 2015 with the National Council (Staff side) wherein it was agreed that the Commission would have a detailed engagement with the Staff side as part of its final deliberations. Sub: Committee for evolving a new formula for Productivity Linked Bonus (PLB) on Indian Railways – reg. (i) Railway Board’s letter No. ERC-1/2014/23/15 dated 21/03/2014. (ii) NFIR’s letter No. I/10/Pt. IV dated 09/04/2014. (iii) Railway Board’s letter No. E(P&A)II-2013/PLB-8 dated 11/02/2015 and 03/03/2015. At the outset, NFIR invites kind attention of the Railway Board to Federation’s letter dated 09/04/2014 wherein Federation had conveyed its disagreement to the Railway Board’s decision for disturbing the bipartite agreement and proceeding with formation of a Committee of AMs for evolving new formula for calculation of Productivity Linked Bonus (PLB) in Railways. 2. NFIR also takes strong objection to the views of the AMs Committee who feel that the Scheme for PL Bonus for Railway employees was introduced in consultation with the two Federations. In this connection, NFIR desires to clarify that the bipartite agreement for payment of PL Bonus to Railway employees was signed jointly by the Railway Board and Federations on 22nd November 1979. Federations further desires to state that the agreement can only be modified with mutual consent of the stake holders. 3. From the above it could be seen that the PL Bonus agreement was reached in the year 1979 for providing substantial motivation to the workforce for achieving higher production by way of enhancing their output and improved quality of service. Over the years the freight loading has been improved as a result of dedicated efforts of workforce. 4. It is further stated that since the last two years, the Railway Board has been attempting to reduce the number of days of wages towards payment of PL Bonus in the name of Capital Input. There were strong protest and the Federations did not agree for any reduction of 78 days wages. The Railway Ministry had accordingly paid PL Bonus to Railway employees equivalent of 78 days wages with notional calculation of salary @ Rs. 3500 p.m. during two previous years. A bench mark “78 days wages” needs to be adopted in any case when a formula is required to be finalized in consultation with us. Equally the salary calculation ceiling should be removed as the payment of bonus for Railway employees is linked to the productivity as enunciated in the agreement dated 22 November 1979. NFIR hopes that the Railway Board would give serious consideration to the above points and take steps towards reaching an agreement with the Federations in the interest of preserving healthy industrial relations in the Railways. The Central Government employees are marking their attendance in the Aadhar Enabled Biometric Attendance System (AEBAS). There is a difference between the number of registered employees and number of employees marking their attendance. The Department of Personnel & Training has issued fresh instructions to all Ministries/ Departments on 28.01.2015 that necessary directions may be issued to all employees to mark their attendance in the Biometric Attendance Portal on regular basis. Biometric attendance system is an enabling platform for marking of attendance. There is no change in the instructions relating to office hours, late attendance etc. There is no proposal to introduce an alternative system. This was stated by the Minister of State for Personnel, Public Grievances and Pensions and Minister of State in Prime Minister’s office Dr. Jitendra Singh in a written reply to a question by Shri Dushyant Chautala in the Lok Sabha today. The Supreme Court of India laid down formal guidelines for dealing with sexual harassment at the workplace in the case of Vishakha Vs. State of Rajasthan. The guidelines clearly state that all workplaces should constitute a Complaint Committee to deal with complaints of sexual harassment. Taking forward the Supreme Court guidelines, “Sexual Harassment of Women at Workplace (Prevention, Prohibition and Redressal) Act, 2013” was enacted which came into force with effect from 9th December 2013. The Act casts a responsibility on every employer to create an environment which is free from sexual harassment. Employers are required to organize workshops and awareness programmes at regular intervals for sensitizing the employees about the provision of this legislation and display notices regarding the constitution of Internal Committee, penal consequences of sexual harassment etc. An employer will be liable to a fine of Rs 50,000/- in case of violation of his duties under the Act and in case of subsequent violations, the amount of fine will be double together with penalty in the form of cancelation of his licence, withdrawal or non-renewal of the registration required for carrying out his activity. The Ministry of Women and Child Development had issued advisories to States/UTs to ensure effective implementation of the Act. The Ministries/Departments in Government of India have also been advised to ensure the compliance of the Act. This information was given by the Union Minister of Women and Child Development, Smt. Maneka Sanjay Gandhi a in written reply to an unstarred question in the Rajya Sabha today. Declaration of Holiday on 14th April, 2015 - Birthday of Dr. B.R. Ambedkar. தேசிய சங்கத்தின் தார்மீக ஆதரவு தொடரும். SUB: Request for harmonious settlement of agitation at Madurai division, Tamilnadu-reg. We are concerned ,genuinely and immensely , about the agitation of Maduari Divisional union of AIPEU GR C, marked by the indefinite fast commenced and -being continued- by the divisional secretary from today. We without dwelling at length about the details of the demand of the said union for the cause of the agitation, we readily wish to acknowledge the demands are workers oriented and for the upholding the welfare of working class. We request your kindself to the reason out the bonafide grievance of Postal staff- regardless of the cadre- in Southern Region under the tyrannical attitude of the regional officers which are in the clutches of one and same officers in for the last several years. We take this opportunity to express our solidarity towards all the might and meek of this agitation and its aim -with solemn motive of upholding the fraternity- for general cause. We further request your erudite self to intervene and settle the issues amicably by causing cordial negotiation across the table and further in not letting the agitation to go further emotive, since the course of agitation ( fast unto death), is one of the proven ahimsa mode with all pervasive and indomitable potency. 1.The General Secretary , NAPE GR C , New Delhi. 3.The Divisional Secretary, AIPEU GR C , Madurai division. 1) ENCASHMENT OF LEAVE: The benefit of encashment of Privilege Leave will be available even in the cases of resignations from the Bank after 20 years of service as well on loss of job due to punishments (other than cases of punishment of Dismissal and cases where there is loss to the Bank). 2) LEAVE: The present stipulation that Casual Leave (CL) upto 4 days can be availed continuously provided the total absence including Sundays and holidays does not exceed more than 6 days would be deleted. 3) Presently Unavailed Casual Leave (UCL) can be availed for a day without production of medical certificate. In addition UCL may be availed without production of medical certificate for 4 days at a time once in a year or 2 days at a time twice in a year. 4) Privilege Leave (PL) can be availed on 4 occasions in a year (as against 3 occasions at present). 5) 15 days’ Notice would be sufficient to avail Privilege Leave (as against 30 days’ notice at present). 6) Privilege Leave can be accumulated upto 270 days (as against the existing ceiling of 240 days). However, encashment upto 240 days would continue as at present. 7) Special Sick Leave with Salary for a maximum period of 30 days would be sanctioned to an employee while on hospitalisation for donation of kidney or any organ. 8) Maternity Leave, within the overall entitlement, would be granted for 60 days (now 45 days) in the case of hysterectomy. 10) The above facility of Maternity Leave would also be available to a biological mother in cases where the child is born through surrogacy. 11) Part time employees would also be entitled to Maternity Leave under (9) and (10) above. 12) Paternity Leave would be extended on the lines of Government employees i.e. 15 days at a time on 2 occasions. 13) Study Leave upto 2 years would be sanctioned to workmen employees as available to officers. 14) Sabbatical Leave for women employees would continue to be extended on the lines of government guidelines. 15) Sabbatical Leave for male employees would be referred to the Government for consideration. 16) Extraordinary Leave (without Pay) would be sanctioned upto a max. of 720 days during the entire service (as against the existing ceiling of 12 months). 17) Special Casual Leave for absence due to curfew would include exigencies like riots, prohibitory orders, natural calamities. 18) Special Leave for Sports activities, trekking, mountaineering, etc, would be dealt with at each Bank level. 19) INTRODUCTION OF LEAVE BANK: System of Leave Bank would be introduced by which employees can voluntarily donate a part of their entitled leave to a common pool from out of which leave with salary would be sanctioned to employees who are compelled to be on prolonged leave due to treatment of major diseases/accidents and other contingencies beyond their control and where such employees have exhausted all their leave. 20) Diem Allowance: Diem Allowance payable while on travel on duty would be revised upwardly and quantum would be finalised in the next meeting. 21) When employees travel on duty to another station and stay in a hotel, the room rent would be reimbursed; the eligible rates would be finalised in the next meeting. 22) Transportation of goods while on transfer: An employee while on transfer from one station to another can transport his personal effects by train or road (even if the places are connected by train) upto the stipulated weights by an IBA approved Transport Operator. 26) Pension for part time employees: The entire service period would be taken for arriving at eligible pension instead of pro-rata service. Important issues like construction of revised Pay Scales, revised DA formula, HRA rates, Transport Pay, introduction of Grade Pay, revision of Special Pay, LFC, revision in other allowances, retirees’ issues, etc. and other issues/ demands would be taken up for discussions in the subsequent rounds of meetings. Further development on these issues will be informed to members in due course. The number of sanctioned posts and number in position of Class-C employees including erstwhile Group D employees in various Ministries/Departments as available in the Brochure on Pay and Allowances of Central Government Civilian Employees 2012-13 as on 1.3.2012, published by Pay Research Unit, Department of Expenditure, Ministry of Finance, is 33,52,380 and 28,06,369 respectively. The posts sanctioned in Government Departments are required to be filled as and when vacancies arise as per the Recruitment Rules. Instructions have been issued that requisitions for Multi-Tasking Staff (MTS) may be made to the recruiting agency. This was stated by the Minister of State for Personnel, Public Grievances and Pensions and Minister of State in Prime Minister’s office Dr. Jitendra Singh in a written reply to a question by Shri Ram Tahal Choudhary and Dr. Manoj Rajoria in the Lok Sabha today. National Informatics Centre (NIC) has developed work flow based application software for visitor management at any office known as eVisitor. It is a web based solution hosted at the NIC data centre and can be accessed / adopted by any Government office just by providing necessary master data for on-boarding. Government has taken initiative to digitize Government files and documents for its easy accessibility. NIC is providing technical support and consultancy on digitization of files and documents to the various Ministries / departments. Government has conceived Mission Mode Project (MMPs) under National e-Governance Plan (NeGP) to improve service delivery system in the Central /State Government Ministries / Departments. The responsibility of provisioning of funds and digitization of file and documents rests with the concerned Ministry/Department/Organization. NIC has also developed and implemented eOffice application. The e Office application aims to support governance by ushering in more effective and transparent inter and intra-government processes. eOffice is Mission Mode Project under the National E-Governance Plan. This was stated by the Minister of State for Personnel, Public Grievances and Pensions and Minister of State in Prime Minister’s office Dr. Jitendra Singh in a written reply to a question by Shri Ramesh Chander Kaushik in the Lok Sabha today. There are provisions which prescribe that a female Government servant (including an apprentice) with less than two surviving children may be granted maternity leave by an authority competent to grant leave for a period of 180 days from the date of its commencement. During such period, she shall be paid leave salary equal to the pay drawn immediately before proceeding on leave. This was stated by the Minister of State for Personnel, Public Grievances and Pensions and Minister of State in Prime Minister’s office Dr. Jitendra Singh in a written reply to a question by Shri Kirti Azad in the Lok Sabha today. This is one card game the government looks set to lose. The highest court in the land on Monday pulled out the foundations from under the United Progressive Alliance government's flagship Aadhaar scheme, directing the Centre to immediately withdraw instructions that make the cards mandatory for availing government schemes or subsidies. No less significant was the fact that the court directed the Unique Identification Authority of India (UIDAI) not to share biometric or other personal information with anyone without the permission of the cardholder. "I received a lot of letters which say Aadhaar card is mandatory despite court orders. One person in a letter said his marriage is not registered because of the lack of Aadhaar card, (others) say they can't get their properties registered. We had already passed orders saying no one should suffer for not having Aadhaar card," a bench headed by Justice B.S. Chauhan said. "If there are any instructions that Aadhaar is mandatory, it should be withdrawn immediately," the bench said. Strongly defending the card, the Centre recently said it was essential for good governance, transparent implementation of government programmes and ensuring that benefits reach only eligible persons. It pointed out to the court that it had enrolled 53 crore citizens till September 30, 2013 after spending Rs 3,494 crore, and it had to be ensured that this huge amount did not go down the drain.